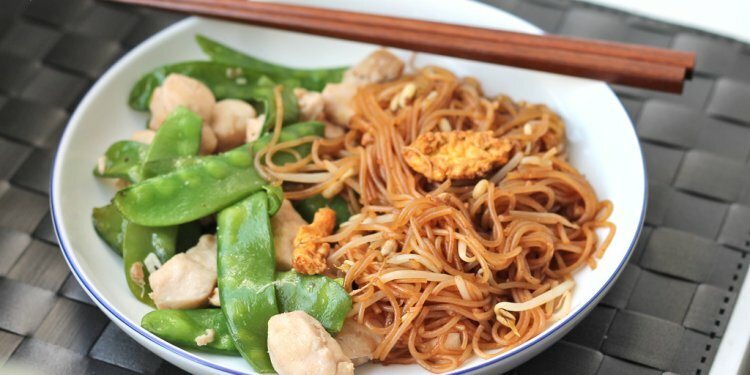 A simple and easy stir fry prepared and cooked in minutes with no marinading needed! Crunchy green vegetables and tender crispy chicken stir fried in a beautifully flavoured teriyaki sauce. A hint of garlic adds a twist on a traditional Japanese inspired dish. Better than any teriyaki sauce found in a bottle. The absolute best dishes to prepare are stir fries. They’re so quick and easy, full of healthy, fresh and crispy vegetables and beautiful sauces; it’s usually a guarantee whoever you’re cooking for will love the outcome — no matter what the flavours. Well, it just so happens that in my house, we are all over teriyaki like bees on honey. Whenever we order out, this is our numero uno preference. The lady at the Japanese restaurant knows it’s me ringing as soon as I call. We have developed a pretty cool relationship now. Really. You know it’s special when you go from ‘ma’am’ to first names. I think it’s safe to say I’m ‘in.’ How.ever. I used to make this particular Teriyaki dish allllllll the tiiiiiyme. And it’s about time I brought it to you guys. Now, I know it’s pretty standard to cook up a teriyaki stir fry, as the recipes are usually all the same. But, it’s not in my nature to follow anything. I don’t know why…it’s kinda like a blogger condition I’ve developed over time. And this one didn’t escape my clutches. Because to this teriyaki, I add a hint of garlic to add just the perfect amount of flavour to it, with a little more sweet mirin and a tiny amount of water to make the teriyaki sauce into a beautiful thick syrup that envelopes the chicken and gives it an amazing texture and an irresistible sweet flavour. I don’t use any cornstarch/flour in this recipe simply because by simmering the chicken in the brown sugar, it naturally thickens the sauce into an almost soy sauce caramel syrup. Another tip: stir frying your vegetables before cooking your chicken. There’s nothing worse than soggy vegetables in a stir fry lacking in colour and crunch. And I finally learnt that lesson a few years ago. Enjoy with your stir fried veg for a lower in carb option, or over some steamed white or brown rice.